Simona Halep beat Sloane Stephens, 7-6(6) 3-6 6-4 in two hours and 41 minutes of gripping tennis to win Montreal. This is Halep’s third title of 2018 and also her 10th consecutive win in Montreal having won the title back in 2016. You could write a book about this match! Read on for my jumbled thoughts and 10 highlights from Sunday’s Montreal final. There is recency bias in the air with the Montreal final having barely finished an hour ago. Still, in my opinion, this was one of the best matches of the year. The stats don’t really back it up but for entertainment, this match had it all. This probably stands out even more because I feel like we haven’t seen a really great match for a while. The French Open and Wimbledon were both missing a classic, particularly when compared to the long list of fantastic matches from this year’s Australian Open. This match further stood out because of the lack of competitive matches towards the end of Montreal with the quarter-finals and semi-finals all being decided in straight sets. Best matches is a very subjective thing. This match will definitely be in the mix when I come to write my best matches post for 2018. Lasting over 70 minutes, the first set was one of the most gripping of the entire year. Stephens missed four set points having been down 1-4 and a point for 1-5. 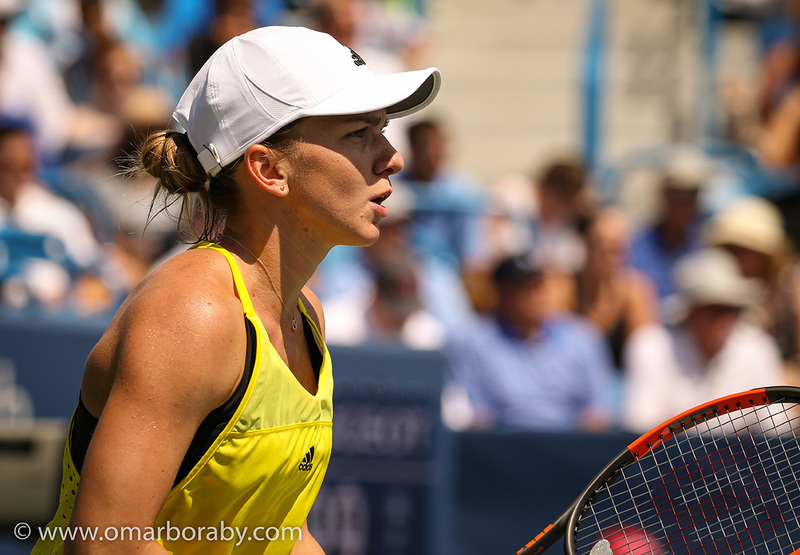 It was surprising to me how well Halep started because I remember so many finals where she has started slowly. The grunt was there from the first few games and she was totally on top of the rallies, playing aggressively with down-the-line strikes. Halep lost her way from the bright start and played a pretty tame service game trying to serve it out at *5-4. The set then swung rather rapidly so that it was Stephens who missed opportunities with two set points on Halep’s serve at 6-5 and then two more in the ensuing tiebreak. At 6-6 in the tiebreak, it was Halep who the braver of the pair and went after her shots, finishing a lung-busting rally with a brilliant backhand winner down-the-line. Serving at *2-2 *40-0, I thought Stephens was winning this match. Stephens was hitting clean winners with such pure ballstriking. Halep had her foot retaped at the end of the second set and began to look tired having been up an early break in the set. I also started to think about Halep’s week, which had generally been more taxing having played two matches on Thursday. Of course that was a wild statement to be making (all of this in my head!) considering the twists and turns of this match. Stephens sat back from *2-2 *40-0 and became increasingly passive, allowing Halep back into contention. From that position, Halep seemed to find a new lease of life by breaking and then consolidating the break with arguably her most impressive service game of the match. Halep missed a match point serving for at *5-2 on a double fault and then two more in the next game at 5-3*. The third match point was a sensational save from Stephens with Stephens forcing Halep out wide with the forehand and then following it in for the volley. Such clear thinking and very bold! It makes such a difference when the crowd are fully engaged and that really came across watching on TV. I am more pumped up for matches when the atmosphere is buzzing. It was a shame though that the Halep fans got a bit over excited at the end and were calling out in between first and second serves, even on Halep’s serves! There’s been a lot of debates about coaching timeouts. Personally, I am totally in favour of them. So many sports allow coaching so I don’t see why it’s such an issue with tennis and it’s always fascinating to me! Halep had Darren Cahill on court at *4-3 in the first set and he tried so hard to get her to see the positives. Halep wasn’t having any of it! Her attitude was so negative and she was knotted up on a few misses. While Halep did lose her way in the first set and chucked her racquet in the first set tiebreak, I admired her spirit to still tough out that first set. Her attitude on court was much calmer in the final two sets. The Stephens-Murray partnership is on the money. He had me in stitches at his comment in their first changeover chat in the first set when he said I don’t want to see your feet in Montreal (referring to the sign). His overriding message was to get up on the baseline through all their chats. He was so clear and concise in how he advised Stephens with just a couple of pointers. Not too much information and the right amount to give her something to work on. Each time, Stephens seemed to take on board his suggestions. Three points below are linked below from the WTA’s Twitter page. If you have three hours spare, then I would recommend watching back the match in full on WTA TV.
.@Simona_Halep takes the break with an epic point! I think both players come out of this match very positively. For Stephens, this match was a constant battle to stay up on the baseline. She didn’t do this consistently but there were some wonderful moments where she really went after the forehand. It was always going to be a tough ask to defend all the points from last year and she’s actually gained here in Canada. For Halep, she’s clearly responded well to winning her first Slam. Wimbledon was a tough turnaround. In Montreal she produced some really fantastic tennis. She was pushed hard in the final and showed signs of breaking. Ultimately she brought it back in the end and backed herself. Halep is scheduled to play Cincy AND New Haven so i’d expect a change in her schedule considering the nature of her title win this week. "When you play an awesome point and you guys erupt, I get chills in my body"
Follow Moo’s Tennis Blog on Twitter, Facebook and Instagram. Photo by Omar Boraby Photography. August 12, 2018 in Halep, Match Review, Stephens, WTA. Nice review. I didn’t watch, as I am on a downer after Doc Buz injury. I thought I already replied to this but I must not have submitted. It’s so good to see Halep finally becoming the champion we expected her to become a few years ago. I will admit I doubted her for a while, but she’s really taking charge of the tour despite really tough competition! I definitely doubted it too. I didn’t expect Halep to slump though after winning the French Open like many first time winners.